Q.) When will I receive my tree certificate? Q.) If I attend the event without becoming a member will a tree still be planted in my name or the name of my company? A.) No, we will utilize 25% of cash collected at the event and plant as many trees as possible with those funds. With your permission we may publish a photo of the multiple tree certificate to social media with you being tagged as one of the many tree planters and event attendees. We will also publish the photo on this page and in South Florida magazine. Q.) Who should join Luxury Chamber of Commerce? A.) Fashion Designers, Luxury Real Estate Brokers, Yacht Brokers, Philanthropists, Local Celebrities, Golf Industry Professionals, Small Business Owners, C-Level Executives, Socialites, Artists and those involved in related industry. 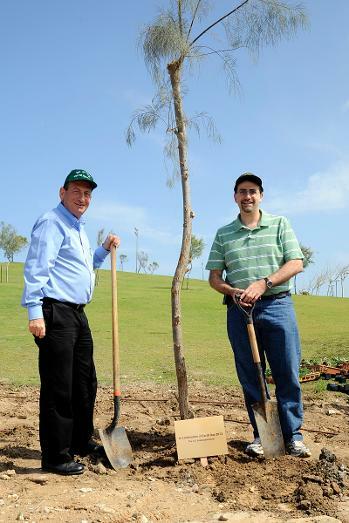 Thank you for visiting Plant a tree in Israel. This page is published by Luxury Chamber of Commerce. We are a grass roots 4-profit business networking group that selects a different charity every month and donates a percentage of funds to the benefactor. From now through the end of October we are focusing on planting trees in Israel via Chamber Membership Drive, our Luxtoberfest event and for those who cannot attend the event or become a member we will gladly process your individual tree planting during the month of October 2018. 2.) Attend the Luxtoberfest event on October 15th from 6-9pm at Sawgrass Mills Mall in Sunrise, FL. We will plant trees with 25% of the cash collected at the door. Please help us spread the word. To see the event click next event in the menu bar on top of the webpage. 3.) Become an individual member and we will plant a tree in your honor and introduce you on the microphone at our next event and take photos of you with your tree certificate and other chamber members and local notables. Post-event photos will be published in South Florida Magazine. 4.) Become a small business member and we will plant three trees. 5.) Become a member sponsor and we will plant 10 trees. 6.) Become a corporate sponsor and we will plant 18 trees. 7.) Become a title sponsor and we will plant 100 trees.